Are artificial reefs being used along the Treasure Coast? If so, where are they and how do they affect you? 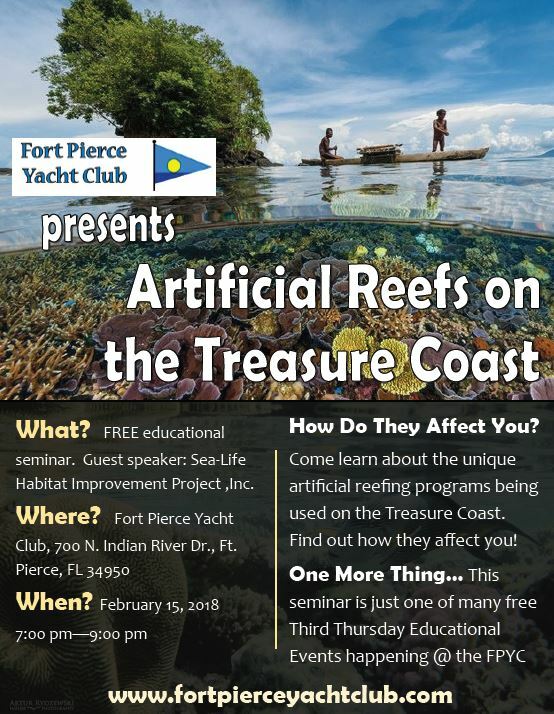 As part of our Third Thursday Educational Series, the Fort Pierce Yacht Club is pleased to present April Price, Executive Director of Sea-Life Habitat Improvement Project, Inc. Learn where these reefs are and how the unique artificial reef programs that are being used benefit local tourism, wildlife, and scientific research. The event starts at 7:00 p.m. and ends at 9:00 p.m. Arrive a little early, this is a public event and seats may fill up quickly!